A powerful smartphone like the Samsung Galaxy S5 has a tendency to overheat. In fact, there were already a lot of users complaining about this specific issue. The thing is overheating can be caused by a hardware problem, which leaves the owner helpless, or by sheer mishandling of the phone, which includes but not limited to over usage and improper charging. Unlike other articles that tell you to disable a bunch of features in your phone, this post will tell you what shouldn't do to prevent Galaxy S5 from overheating. Out of curiosity, you can also try to do them to see if the phone really overheats. It would surely be helpful if you saw it with your own eyes. If you noticed, the screen heats up when it's left on for hours. In fact, it is one of the components that heat up faster when the phone is in use. So, when you plug your phone in to charge, make sure the screen is turned off. Better yet, adjust the screen brightness to the lowest level while the battery is being replenished. The phone heats up when you download a large file over mobile data network for several minutes. Imagine how hot it would be if you left the screen on while mobile data is actively used. This is a big concern especially for owners who are connected to a 3G network. It's because it would take more time to download large files like movies and videos. I am a huge fan of Real Racing 3 and other good racing simulators out there. Games like these can heat up your phone faster. 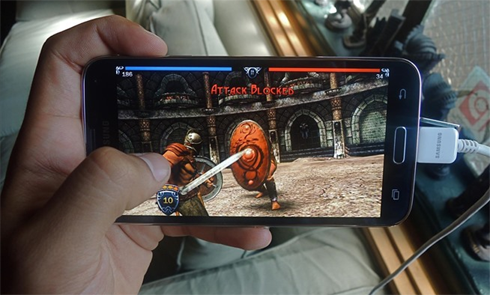 Now imagine what happens when you charge the phone and play heavy games with high-definition graphics for hours. Never place the phone near a stove, over the fridge or leave it in your car for hours. External heat not only cause overheating but can make the battery swell and even explode when temperature goes way beyond the threshold. There were reports of Galaxy S5 overheating even if almost all features and radios were turned off. This is, of course, a hardware problem and there's nothing you can do to fix it except return the phone to your service provider or where you bought and/or have it replaced. So, how would you know if the phone is defective since day 1? Do not change any settings in your phone during the first boot up and leave it as is until the battery is depleted. If the it overheats, then have it replaced as soon as possible. The Samsung Galaxy S5 was set to work at its best with its factory settings and if you leave it as is, it will never overheat unless there's a hardware issue. While others would advice you to handicap your phone to prevent it from overheating, well, that's not just practical because those features are one of the reasons why you chose it over others. If you're planning to buy or already bought a Galaxy S5, spend a day or two to observe the phone closely. If nothing unusual happened after that, then proceed with installing all apps you want and use the phone according to your needs…just don't abuse it. In case you have questions or problems with your Android phone, feel free to email me at harold@droidista.com and/or join the small community of smartphone owners I created to provide free support.